Baby-fine hair can be a blessing because it’s easy to manage…until you try to style it. Styling products that work well for curly, coarse, or thick hair don’t have the same effect on fine hair. We’ve rounded up a few hair products for fine hair that will add volume and body without weighing you down. First, the basics: Shampoo and conditioner. There are plenty of volumizing shampoos on the market, which work by coating the hair shaft in a residue to bulk it up and separate it from your other strands. However, this also can leave your hair feeling sort of flat and, you guessed it, weighed down. Since you have baby-fine hair, you may want to try baby shampoo. Before you write it off as a shampoo for…well, babies, remember that this stuff is gentle and won’t strip your hair of its natural oils. 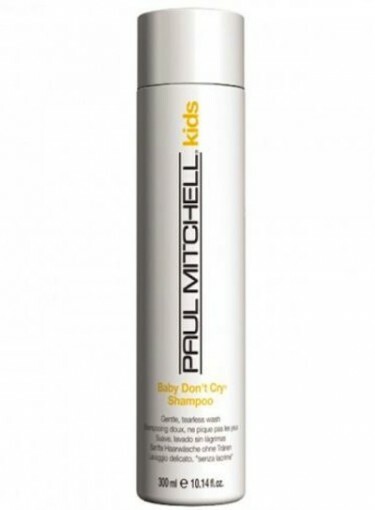 While Johnson & Johnson is a baby shampoo staple, if you want to feel like more of a grown-up, try Paul Mitchell’s Baby Don’t Cry Shampoo ($11). When it comes to conditioner, don’t overdo it. As in, don’t condition your hair everyday. If you’re addicted to that silky smooth feeling, use a leave-in conditioner on the tips of your hair. Deep conditioning masks aren’t necessary for your whole head, but use them to nourish the tips of your hair. If you’re afraid your hair will get too oily, check out these oily hair tips. Styling hair products for fine hair can be tricky. Serums are too heavy and greasy for your hair, so stay away from them. A matte wax (a lot of guys use them) will style your hair without leaving a coating that screams "too much product!" Find a flexible-hold hairspray for amping up your hair. Try Pantene Pro-V Classic Care Touchable Hairspray ($4) for a budget-friendly choice. When it comes to hair products for fine hair, "less is more" is a good mantra to take on. To get started trying these hair products for fine hair, view our fine hairstyles gallery.